Made from 90% recycled material, this quality Leitz Signature Book allows you to store and organise official documents, such as contracts, invoices and applications that require signed approval. 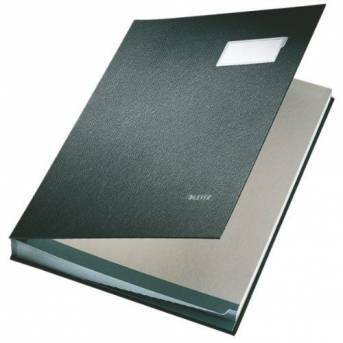 The book features hardboard covers which are coated with polypropylene foil for water resistance. Inside are 20 rigid card dividers with a special textured surface to help keep contents secure. Each divider features a window for viewing contents and a tab at the bottom for ease of access. The front cover also features a labelholder for personalisation. This black signature book measures W240 x D28 x H340mm.